The latest version of WordPress comes with a trash feature which basically work just like recycle bin on your Windows computer. 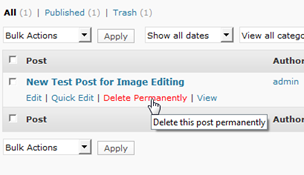 When you delete a post, page or comment, instead of permanent deletion, it goes into trash. So, you can restore it later if you realize that it was deleted accidentally. That’s it. You’ll now see “Delete Permanently” link instead of “Trash”. This will tell WordPress to empty trash after every three days. You can configure the number of days to suit your requirements.